We offer our clients technically superior bitumen testing equipment such as bitumen testing machine, ring & ball, test apparatus, ductility testing machine, Bitumen Testing Apparatus manufacturers, Bitumen Testing Apparatus. 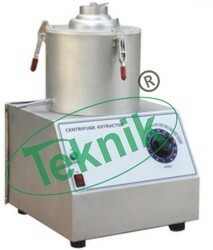 Bitumen Testing Instruments - Bitumen Testing Instruments, Asphalt Testing Equipment and Binder Extractor. 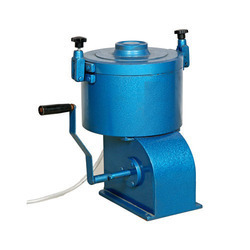 Manufacturer and supplier of testing instrument, bitumen testing instrument, industrial testing instrument, hydraulic testing instrument, Material testing equipment. Introduction This Equipment is to speed up the process with ease and accuracy to prepare cylindrical specimens for Marshal Stability Testing Machine. The compactor has been designed to simulate hand compaction as described in ASTM D1559. This apparatus automatically compacts the sample and stops after preset number of blows has been completed. The Compactor gives Uniformly and accurately compacted marshal moulds for reliable testing. It is fitted with a compaction rammer of 98.5mm dia, weighing 4.535 kg. with a free fall of 457 mm. The rammer assembly is provided with a ratchet and pawl arrangement to lift it from the top of the test sample. When the rammer reaches the required height the pawl release the rammer which falls freely on test specimen. The release mechanism is connected by an arm moving up and down which is connected to a reduction gear coupled to the motor through another arm. An automatic blow counter fitted to the compactor is used to set the number of blows. The Compactor is supplied complete with wooden pedestal. Suitable to work on 220V, 50 Hz, AC single phase. The motorised version is provided with a variable speed control device and a hand brake to stop rotation when switched off. The electric motor is of 0.25 HP capacity coupled to a geared assembly. Suitable for operation on 230 Volts, 50 Hz, AC single phase.Recommended Accessories & Consumbles The following accessories and consumables are not part of the standard supply and are mandatory for the testing workFilter paper ( Pack of 100)Electronic balance ( 5 kg/500mg or 5 kg/100mg or 5 kg/10mg)Two Pan Balance of 5 kg capacity with weights. (From 5 kg to 500gm)Analytical weight Box (from 200gm to 1 mg)Transfer TraySpatulaSolvent (Benzene/Toluene)Asbestos hand Gloves. a) Length of the probe arm from pivot to probe point 244cm.b) Length of measurement arm from pivot to dial 122 cm.c) Distance form pivot to front legs 25cm.d) Distance from pivot to rear legs 166cm ande) Lateral spacing of front support legs 33cm. Electrically Operated for determining the ductility of asphalt and bitumen. The ductility of bitumen is expressed as the distance in centimeters to which a standard briquette can be elongated before the thread thus formed breaks under specified conditions. 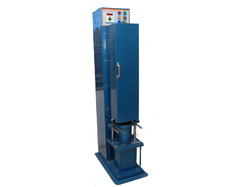 The ductility testing machine is designed to test three specimens simultaneously, and consists of a bath thermostatically controlled with inlet and outlet taps and is equipped with an electric pump circulator & heater and carriage moving over a lead screw. Fixed and movable brackets are so positioned that specimen is submerged in water throughout. A clutch arrangement is made to stop the movement of the movable bracket when rapture of the specimen is noticed. An electric motor driven reduction gear unit ensures smooth constant speed and continuous operation and provides two rates of pull / travel, i.e., 50mm/min and 10 mm/min in the machine. 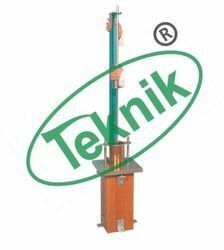 The ductility testing machine is fitted with ½ HP motor. Suitable for Operation on 220V, Single Phase, 50Hz, AC Supply. Accessories : 1. Thermometer IP 38 C, range 23ºC to 27ºC. 2. Briquette mould with base-plate. IntroductionUsed for the measurement of resistance to plastic flow of cylindrical specimens of bituminous paving mixtures when tested in a marshal load frame. Test specimens are produced and tested at a speed of 50.8mm/min.The maximum load(stability) and deformation(flow) of the specimen are recorded. 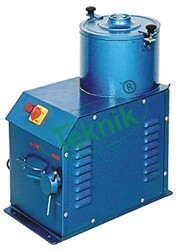 Generally the test is applicable to hot mix designs using bitumen and aggregate of maximum size of 25mm. 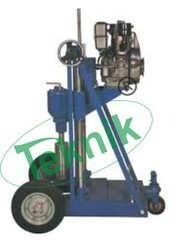 Widely used for designing and evaluating bituminous paving mixes.General Descripation & SpecificationsThe apparatus consist of the followingLoad FrameA floor standing compression loading frame of 50 KN capacity with motor and worm gear housed within the base unit, producing a platen speed of 50.8mm/min. Limit switches are provided to cut out the platen over run on the downward travel. 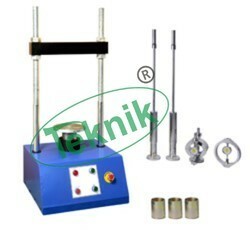 A handle is provided for manual operation during calibration etc. The load frame is fitted with ON/OFF/Reversing switch and power indicator lamp in front. Suitable to work on 230V, 50 Hz, AC single phase. .Marshal Moulds (3 Nos. )4”dia X 3” height specimen moulds, base plates and Extension collar. Manufactured from steel. (6“ dia mould can be supplied at extra cost)Compaction PedestalComprising of a hard wood block with a steel plate, complete with specimen holder, semi circular base and a circular top to hold 4” dia specimen mould in place during compaction of the specimen. 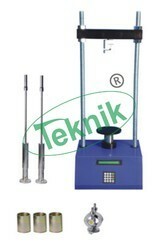 (Pedestal to accommodate 6” dia specimen can be supplied at extra cost)Compaction Hammer (2 Nos. )Designed for use with the compaction pedestal and mould. The hammer has a falling weight of 4.535 kg and free fall of 457 mm.Breaking Head AssemblyConsisting of upper and lower cylindrical segments with provision for fixing flow meter. Suitable to take 4” dia specimens. ( Assembly to accommodate 6” dia specimen can be supplied at extra cost)Specimen ExtractorConsisting of a load transfer bar, pressure plate and steel ball,Optional AccessoriesThe following accessories and consumables are not part of the standard supply and are mandatory for the testing workProving Ring of 30 KN capacity with calibration certificate with traceability.Flow meter Dial Gauge with 0.01mm graduation and 25mm travel.Water bath with Thermostatic or Digital Control with stirrerElectronic Balance of capacity 5 kg/1gm or 2 kg/0.1 gm or Two Pan Balancewith set of weights and analytical weight box.Pair of Asbestos GlovesFilter Paper ( Pack of 100 )Misc. items: Spatula, Scoop, Mixing Tray, Trowel, light mineral oil and Benzene. A depression is made in the sample by a needle of a definite weight, which is measured in tenths of a millimeter and expressed, as penetration number. A standard needle penetrates vertically under surcharge weight of 50 gm into a sample under test temperature at 250C for 5 seconds of duration. This test determines the consistency and thereby the grade of the bitumen. General Descriptions And Specifications: The apparatus is available in two versions, Hand operated and Electrically operated with automatic timer. The apparatus consist of a cast aluminum base with an iron stand on which moves an aluminum arm. A 6" dial is fixed on this arm and a brass chromium plated rod slide through the lower portion of the arm. A needle with weights is fitted to this rod. The dial is graduated from 0-400 in one tenth millimeter sub division. 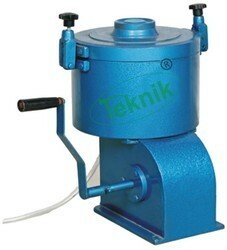 Supplied complete with adjustable needle holder, penetration needle, sample container, transfer dish and weight of 50 gm. The Automatic model is supplied with automatic digital timer and electrical arrangement to carryout the test without need of stop watch and with great ease and accuracy, even by a layman. 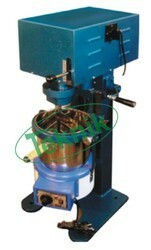 Compaction Mould Comprising Mould body, base plate and combined filling / extraction collar. We are offering a wide range of Compaction Pedestal Testing equipment.Comprising a 300mm sq x 25mm thick steel plate complete with 4 tie rods and securing nuts. A mould clamp and hammer guide are fitted to the plate. The unit is supplied complete with a laminated hardwood block. It consists of body housing, a geared screw jack and motor drive mechanism suitable for operation on 230 V, 50Hz, Single Phase, A.C. supply. This versatile digital loading frame features a microprocessor controlled drive system with stepper motor enabling the operator to easily set any test speed by digital switches. The machine is fitted with an RS 232 C port so it can be remotely controlled by a personal computer. The upper and lower limits of platen travel are set by use of automatic safety cutout switches. All load rings, dial gauges, cells, etc. have to be ordered separately. 380mmRS 232 Port for connection to personal computer. L.V.D.T. can be supplied instead of dial gauge fitted with Breaking Head Assembly. 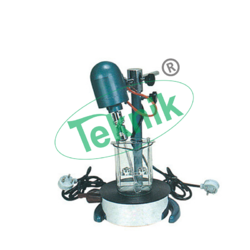 Compressor Spares Glass sample container Thermometer. A suspension of diatomite and water (recommended) is prepared in a stirred tank. The stirrer ensures that the solid remains suspended and does not settle. A pump delivers the suspension into the individual separating chambers of the plate and frame filter press. A separating chamber is formed by one filter frame and two filter plates. The filter plates are grooved and covered over with filter cloths. The filtrate passes through the filter cloth and flows via the grooves in the plates into a collecting pipe. 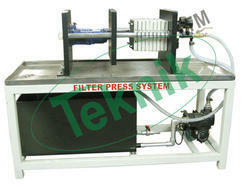 The filtrate exits the plate and frame filter press through the collecting pipe and is collected in the filtrate tank. The solid material is separated off at the filter cloth, where it forms a growing filter cake. As the filter cake becomes thicker, its flow resistance also increases. When the separating chamber is full, or a maximum pressure difference has been reached, the filtration process is ended. The plates and frames of the plate and frame filter press are pulled apart. The filter cake can be removed. For the next filtration the plates and frames must be pushed back together. A spindle is used to press them together. The press forces ensure that the suspension does not leak from the contact points between the plates and the frames, but is forced through the filter cloth. The flow rate through the plate and frame filter press is adjusted by a valve. The pressure occurring during filtration is indicated on a manometer. The filtrate tank is scaled. This means a stopwatch can be used to measure the flow rate. An included opacimeter allows the solid concentration of the filtrate to be determined. 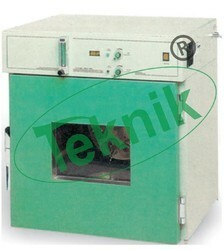 A drying chamber is recommended for evaluation of the experiments. 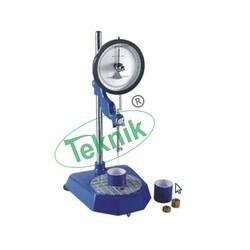 Looking for Bitumen Testing Instruments ?